Israeli Police Rescue Goats On Their Way To Being Illegally Sacrificed In Jerusalem : Goats and Soda This Passover, some Israeli Jews hoped to perform a ritual (and illegal) sacrifice of goats on the Temple Mount. Then the police stepped in. This goat was almost sacrificed, but was rescued at the last minute by an Israeli official. 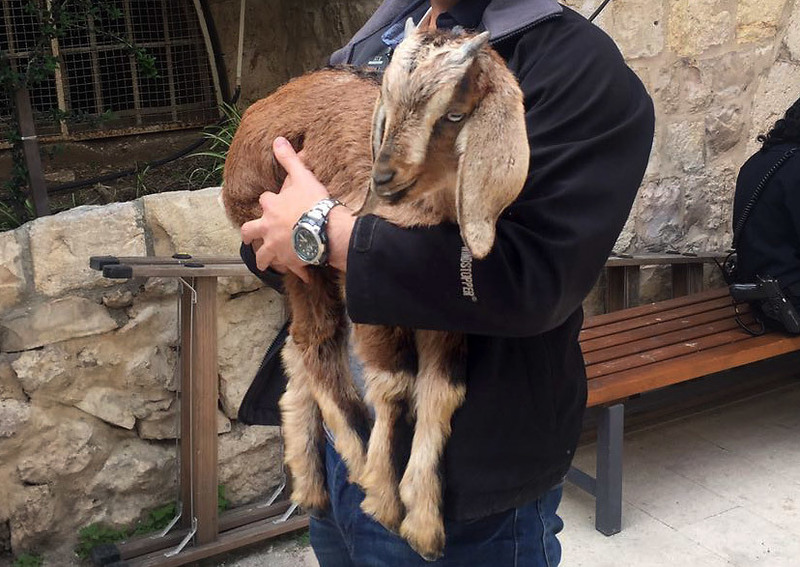 For the last 10 years, on the eve of Passover, the Federman family has loaded a young male goat into their car and driven from their farm in a West Bank Jewish community to the Old City of Jerusalem, where they hoped to slaughter the animal in the ritual sacrifice prescribed in the Bible. The family is not alone in its mission. The number of Israeli Jews approaching Jerusalem with goats prepared for sacrifice has been growing in recent years, according to the Federmans. "Thank God, more people are trying to carry out this commandment," said Elisheva Federman, who has a herd of about 15 goats. Whenever a male goat is born, she does not vaccinate or brand it because that would make it ineligible to be sacrificed. According to the Book of Leviticus, an offering must be "a male without blemish." But each year, police prevent the Federmans and others from slaughtering goats on Jerusalem's Temple Mount. They fear such an act on this site, sacred to Jews for once housing the ancient Jewish temples but also home to Islam's third holiest site, could ignite tensions between Israel and the Palestinians. Muslims refer to the hilltop compound, home to the iconic Dome of the Rock and Al-Aqsa mosque, as the Noble Sanctuary. They believe the Prophet Muhammad journeyed to heaven from there. To keep these tensions in check, Israel and Jordan, which oversees religious affairs at the holy site, have agreed on certain policies. Israel bans non-Muslims from praying there. Only Muslims can enter the Dome of the Rock and Al-Aqsa mosque, a rule set by the Jordanian Waqf, or religious trust. Seeing this arrangement as a violation of their right to religious freedom, and eager to assert a Jewish presence on the Temple Mount, a growing number of religious Jews try to pray, hold weddings and even carry out animal sacrifices there. A number of far-right Israeli politicians support such actions and advocate for increasing Jewish access to the area. But many politicians (and Israelis) see this stance as fueling the Israeli-Palestinian conflict. This week, according to Israeli media, police detained at least 17 people heading for the Temple Mount, including two members of the Federman family, and confiscated six baby goats, saving them from being sacrificed. One of those arrested was 22-year-old yeshiva student Dov Jacobs from the West Bank settlement of Hashmonaim. In a scheme that took weeks of planning in attempts to avoid police detection, Jacobs came to a certain address in Jerusalem's Old City on Monday to pick up a goat. The goat was brought into the ancient walled city from a farm a week earlier, when police were less likely to be on the lookout for animals intended for sacrifice, Jacobs said. Jacobs was to carry the baby goat to the Temple Mount, where his cohorts would be waiting with priestly clothing, a portable altar and tools needed for sacrifice, all specially made according to biblical requirements. "But from the beginning the police were following me," Jacobs said. "I had to sneak around for a couple of hours just to get inside of the house. Then after walking out of the house with the goat for 30 seconds, police stopped me and arrested me." Jacobs was eventually released from detention just a couple of hours before the start of the Passover seder meal. The goat was turned over to the city's veterinary services department. "They will probably even question the goat," quipped Jacobs, who will need to appear in court later this month on charges of conspiring to commit a crime. Animal sacrifice was once a central part of many cultures, including that of ancient Israel. The Bible commanded in great detail daily offerings as well as special offerings for holidays like Passover and for personal reasons, such as committing a sin. Both goats and sheep are acceptable for sacrifice, according to Jewish law. The practice ended for the most part when the Second Temple, which like the First Temple once stood on the Temple Mount, was destroyed in the year 70. Now, rather than daily burnt offerings, religious Jews offer daily prayers. Jews had no access to the Temple Mount between the 1948 and 1967 wars. That changed after Israel gained control of the Old City in the 1967 Mideast War. And the idea of reviving sacrifices has gained traction. Some religious Jews cite writings by the 12th century philosopher Maimonides, who argued that some sacrifices can be made without a temple. Although they remain a minority and are considered a radical fringe by mainstream Judaism, some Israeli rabbis argue that Jews today are still obligated to bring a Passover sacrifice to the Temple Mount because not doing so results in divine punishment. But the established rabbinical position remains that Jews should not set foot on the Temple Mount because it once contained the "holy of holies," the part of the temple that was so sacred that only the high priest entered — and only once a year, on Yom Kippur, the day of atonement. For more than a decade, organizations that hope to eventually build a third temple in Jerusalem have been holding what they call a "practice drill" for the Passover sacrifice. An animal is slaughtered by someone wearing priestly clothing, with trumpets blowing in the background, and the blood is scattered on an altar; but it is not considered an actual sacrifice because police have never allowed it to be held on the Temple Mount. This year, in a surprising move, police allowed the re-enactment to be held inside the Old City walls for the first time, in the main square of the Jewish Quarter, about a quarter of a mile from the Temple Mount. About 200 people attended the event, eating the meat of the slaughtered lamb, according to Israeli media reports. But all other attempts at ritual slaughter have been stopped this year. The confiscated goats were given to the city's veterinary services department, which is caring for the animals while the police and the ministry of agriculture investigate the incidents. "The goats were in very good health," said Frayda Leibtag, the Jerusalem mayor's adviser on international affairs and media. "And they are in good hands now." She said that once the investigation concludes they will be given back to their owners "or good new homes will be found." Federman said officials have never returned their confiscated goats in the past. The family has lost at least 10 goats this way over the years, a monetary loss totaling thousands of dollars. "So for us," she says, "it really is a sacrifice."